Preserved lemons, olives, ginger and saffron are a classic Moroccan combination used in many dishes. Ras El Hanout may also be added. 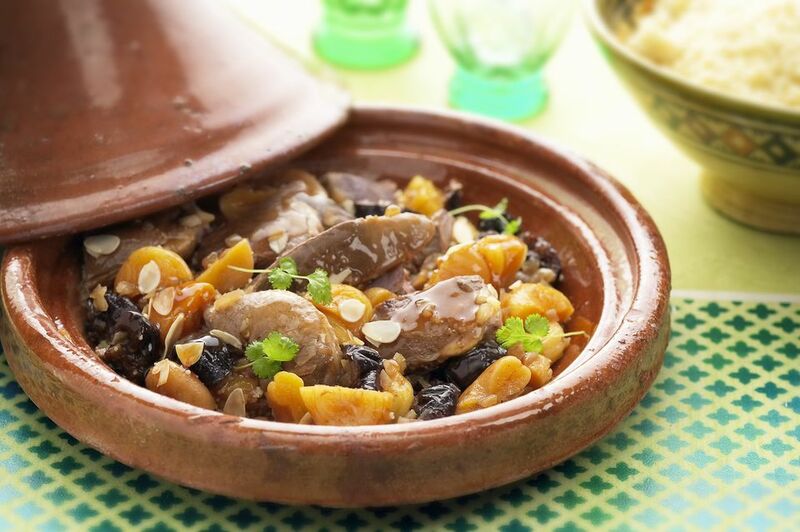 Try making this Moroccan recipe for Lamb with Preserved Lemons and Olives in a traditional Moroccan tagine. Beef or goat may be substituted for the lamb. For instructions on preparing this dish in a pressure cooker or pot, see the alternative recipe for Moroccan Meat with Olives and Preserved Lemons. French fries are a popular accompaniment to this tagine, and can be served on top of the meat. Try the Belgian method of making fries. Remove the flesh from the preserved lemons, and finely chop it. Mix it with the meat, onions, garlic, spices and half of the olive oil. Pour the other half of the olive oil into the bottom of a tagine, and add the lamb and onion mixture. The meat will be less likely to burn on the bottom if you place the meat bone- or fat-side down. Place the parsley and cilantro on top of the meat, add the water, and cover the tagine. Put the tagine over medium-low heat and wait patiently for the tagine to reach a simmer. Once the tagine reaches a simmer, allow it to cook undisturbed for about 2 hours. Use the lowest heat necessary to maintain the gentle simmer. After 2 hours, check the tagine. Add the preserved lemon peels and olives, and a little more water if you feel the liquids have reduced only to oils. Cover the tagine and continue cooking another hour or longer, or until the meat is very tender. Reduce the liquids if necessary, and serve the tagine with Moroccan bread for scooping up the meat and sauce.